Fertilizer – SoHum Living Soil provides all the nutrients your cannabis plants need throughout its life cycle. pH testers/buffers/adjusters – SoHum Living Soil is naturally pH balanced for optimum nutrient uptake. Using your preferred method, provide your seeds with a humid, dark environment in which they can sprout for the first time. DO NOT use any fertilizers or chemicals. Clean, de-chlorinated water is sufficient. If you’re using seedlings, this step isn’t necessary. Just keep your seedlings humid and well-lit while you’re preparing your grow area. While seeds are germinating, you’ve got a few days to get your garden in order. This should be an area that can be kept clean and undisturbed for the duration of the grow. Make sure your “grow room” (tent, closet, basement, quiet corner…etc) is shielded from the sun so you can control lighting precisely. Clean EVERYTHING that will be in your grow area carefully, including walls, floor, lights, and containers. Set up your lights and timers for the vegetative stage – 18 hours of light is a good standard until you’ve got more experience to experiment. Sow your rooted seedlings, along with the medium they were germinated in, at least 2-4 inches into the living soil and gently pat the area until it’s level. Do not overwater at this point. 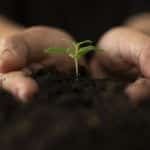 Your soil should naturally be humid enough to attract roots to grow. One to two sprays with a water bottle should be enough to help your babies acclimate to their new home. Practice patience while your cannabis plants do their thing. During your first few crops, you’ll want to visit your garden regularly to make sure your super soil is humid, and your plants are showing no signs of pests or disease. Avoid the temptation to poke, prod or play with your plants too often – they may go as long as a week without needing anything and messing with them too often can stunt or stop their growth. 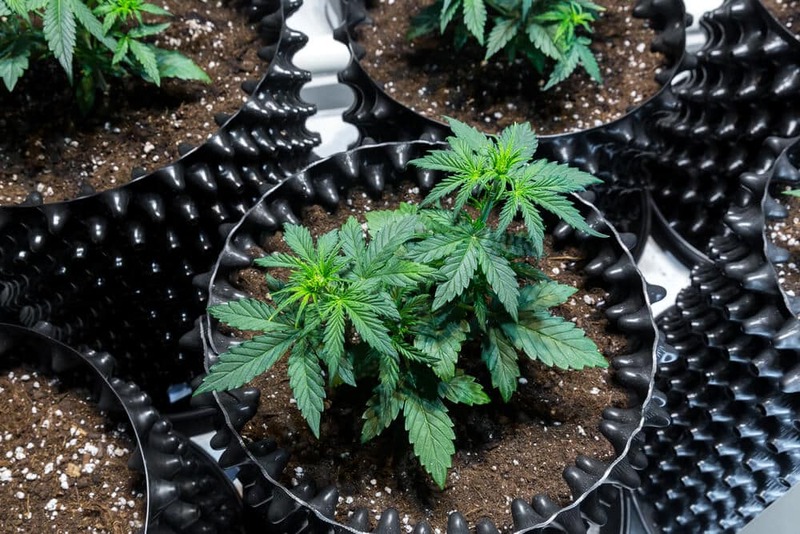 Once you’re a more experienced grower, you’ll find ways to automate your garden, so you don’t need to spend much time with your plants at all these first few weeks. Once your plants have taken root and are growing steadily, you’ll be able to train your plants to grow as you want them to. Here’s where SCROG, SOG, cropping, super cropping will come into play, but for beginners none of this is mandatory. It’s perfectly acceptable just to let nature take its course. When your plants reach the recommended age of maturity for their strain (check with your seed/seedling supplier for a guideline,) change the lighting schedule to 12 hours on/12 hours off. Continue to water only when the soil is dry. There is absolutely no need to add nutrients or fertilizer if you’re using SoHum living soil. Your crop will start to smell pleasant but rather robust at this stage. If the aroma becomes too overwhelming, you can use odor eliminators, carbon filters, etc. at this point to keep it controlled. Step 8: Time To Harvest! When your crop produces dense, healthy flower and roughly 60% or more of the pistils have changed from white to dark red/brown, your grow cycle is complete. Cut your plants at the base and immediately hang them upside down in a dark area to begin the curing process. For more info on how to process your cannabis plants after harvest as well as more advanced tips on making your future crops exceptional, read what the experts have to say on our blog. As you can see, growing cannabis with SoHum Living Soil is almost foolproof! Remember to monitor your plants while they are growing and water them as needed. Control pests, keep the lights on and the air circulating, and you’ll grow excellent cannabis every time. Stock up SoHum Living Soil today and see just how easy growing your own cannabis indoors can be! Thanks a lot for sharing such a helpful guide for beginners and I have pleased to get this blog page. I am new at this circumstance. I have read your valuable page and gotten much information. I want to a little indoor vegetable garden. Now could you please suggest me that what is the best color of light to vegetable grow plant in? I will save your website and I will share it with my friends. I hope they will be benefited by this topic. Hi Jessica, Glad you like the blog page. Please visit our main site http://www.americancannabisconsulting.com there is a webinars tab in place, as well as a resources tab coming soon. Ellis Smith hosts free monthly webinars where you can sign up for free, or find them on the ACC webinars link shortly after they are aired to listen to at your convenience.